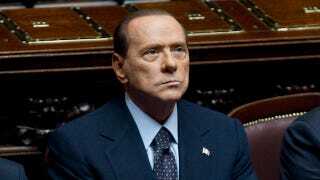 Italian Premier Silvio Berlusconi has finally agreed to resign, meaning the end to his reign of bunga-bunga is in sight. The Times reports that he was under increased pressure to step down after failing to win a majority in today's parliamentary budget vote. He now says he'll leave as soon as Parliament passes a series of economic austerity measures requested by the EU. Once he's gone, he'll lose his immunity from prosecution in several corruption cases, which means that although his political career may be drawing to a close, his legal shitshow is just beginning.